LA PAZ, Bolivia (AP) — The thieves tunneled under the thick walls of the colonial-era Roman Catholic church in the tiny southern Bolivian town of San Miguel de Tomave, emerged through the floor and made off with five 18th-century oil paintings of inestimable value. It was the third time the highlands church had been plundered of sacred art since 2007. Most of the finely-etched silver that once graced its altar was already gone. "Who would have thought they would take the canvases, too?" the Rev. Francisco Dubert, the parish priest, asked of the 2-meter-by-1.75-meter oils depicting the Virgin Mary. Increasingly bold thefts plague colonial churches in remote Andean towns in Bolivia and Peru, where authorities say cultural treasures are disappearing at an alarming rate. At least 10 churches have been hit so far this year in the two culturally rich but economically poor countries. "We think the thefts are being done on behalf of collectors," said the Rev. Salvador Piniero, archbishop of Peru's highlands Ayacucho province. Religious and cultural authorities say criminal bands are stealing "to order" for foreigners. Bolivian churches have been robbed 38 times of 447 objects since 2009 — of highly stylized decorative silverwork, canvases, polished gold and silver altar pieces and gem-encrusted jewelry, said the country's cultural patrimony chief, Lupe Meneses. 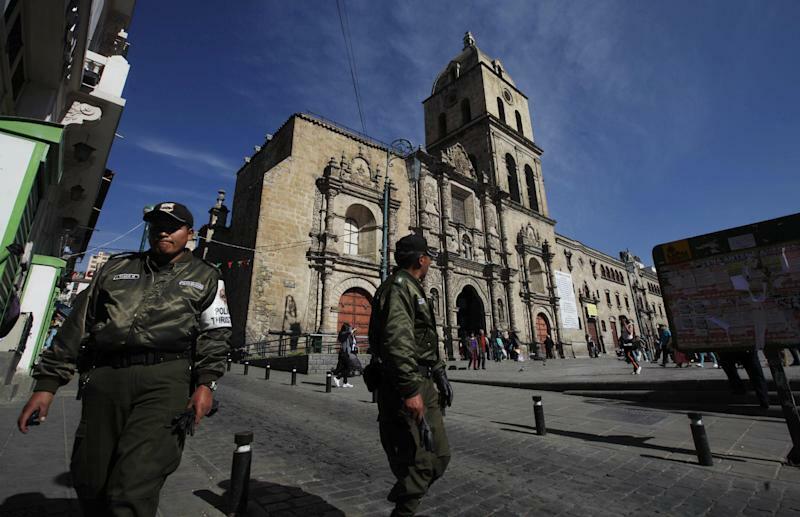 In Peru, at least 30 thefts from churches and chapels have been reported since January 2012, including two this month: Churches in Ayacucho and Puno provinces were robbed of ornamental silver laminate, or gold and silver crowns, earrings and necklaces. In Tomave, other canvases were left behind, Dubert said, indicating the thieves knew exactly what they wanted. "These churches are being robbed because terrible people want to own beautiful things." Donna Yates, a University of Glasgow archaeologist blogged afterward. Yates, who is studying the Andes thefts for a global, European Union-funded project, said the hemorrhaging of priceless ecclesiastical art in the region has continued at a steady pace "but it's getting more brazen." "Who is behind it? I can't say," Yates added. "The market for these goods is in Europe and the United States," she says, with Santa Fe, New Mexico, one destination as a magnet for collectors of Latin American art. Cultural officials in the Andes have long struggled to protect Incan and pre-Columbian cultural treasures. Now, colonial sacred art has become a similar worry. By law, it is all national patrimony, its export illegal. Where possible, churches are being fortified. Video cameras were installed and nighttime guards posted last year at Ayacucho's main cathedral in Huamanga, host to Peru's biggest annual religious pilgrimage. But poor, rural parishes are on their own, particularly along the highlands plateau where Spanish colonial missionaries built isolated settlements. 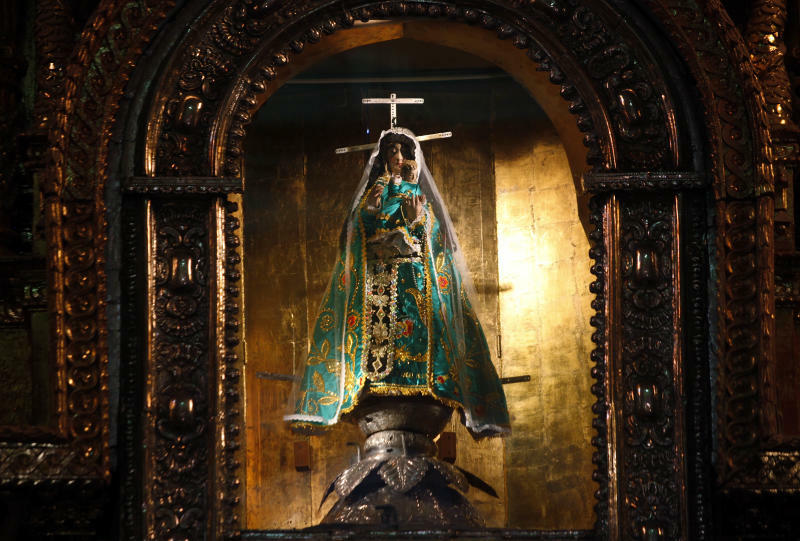 In January, church thieves stole 12 gold crowns and a pair of silver shoes of a baby Jesus statue in the isolated Ayacucho town of Santo Domingo de Chungui, said regional culture director Mario Cueto. He appealed afterward "for greater monitoring on highways and at international airports." But the thefts almost always go unsolved. In one of the most audacious thefts, national treasures disappeared in April from the Church of the Virgin of Copacabana on Lake Titicaca. A wooden 16th-century statue of Bolivia's patron saint was stripped of 18 precious jewels worth an estimated $1 million by thieves who poisoned two mastiffs and laced the parish workers' evening meal with tranquilizers. While everyone slept, the thieves broke a window and gained entry with a ladder. A visiting priest and the female owner of a hostel where he was staying were arrested in the theft. Prosecutors say they are suspected of assisting a criminal gang. Most targets are more like the Tomave church, unprotected by anything more than a lock and chain on the door when last burgled in December. Most are built above 13,100 feet and at least 60 miles from the nearest police station. As for burglar alarms, electricity is unreliable when it exists at all. "Security is impossible," said Yates. "You are left with the kind of situation where you could either try to take all the goods out of these rural churches, which is ethnically questionable because you are taking people's heritage away from them." Even if the art were removed, there is no place to safely store it. Not even the La Merced church in Bolivia's southern regional capital of Potosi, whose silver mine was once the Spanish empire's economic engine, was immune from one of the year's biggest heists. Among loot stolen after an alarm was deactivated: An 18th-century scapular shield encrusted with pearls, diamonds, rubies and emeralds worth an estimated $1 million. Also taken: part of a huge silver archway laminate. Peru's cultural patrimony director, Blanca Alva, says much of the stolen silver is simply melted down. If it were merely stolen, she said, "at least it would be conserved and I'd hope it could be recovered." Yet authorities have had little luck recovering colonial art. Officials at Bolivia's Culture Ministry were reluctant to share details of stolen items, fearing it could boost their black-market value. 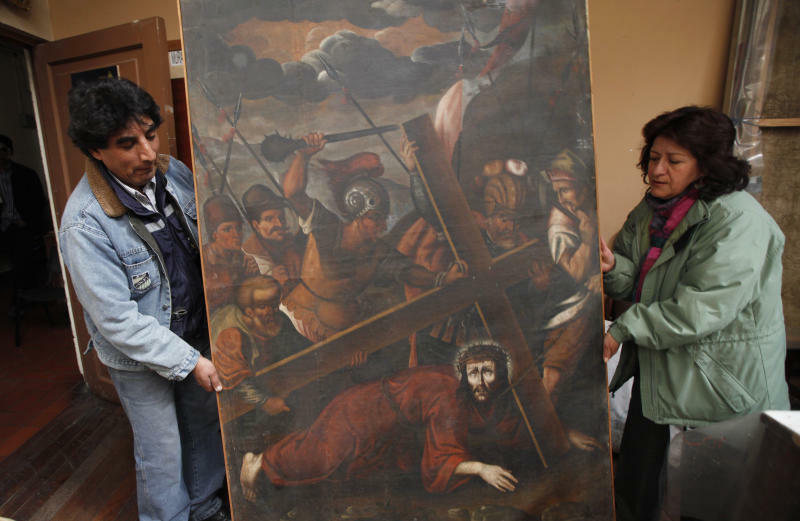 A rare victory came in 2005 when 18th-century paintings of St. Francis of Assisi and Jesus Christ stolen from the San Pedro de la Paz church in Bolivia were recovered in Lima, Peru, where someone had tried to sell them to foreigners for $100,000. "That's why this country should have a specialized (antiquities) police, like Italy," said Carlos Rua, the ministry's chief of artistic restoration. No country in the region has more than a handful of police working regularly on antiquities thefts. The rare times that plunderers are caught, consequences can be dire. Police held up by a swollen river arrived too late in Quila Quila, a Quechua-speaking village in Bolivia's southern highlands, to save the thieves whom villagers caught the previous day absconding from their church with canvases and jewels. Local journalist Henry Ayra said the men were caught, beaten and buried in the churchyard on March 5, 2012. Local police Maj. Bismark Pereira told the AP his men unearthed and carted away the handcuffed corpses. He he could not confirm reports the men were buried alive. "The community," said Pereira, "had entered into a pact of silence." Bajak reported from Lima, Peru. Associated Press writer Carla Salazar also contributed from Lima.